Today, June 6, is Sweden's National Day! We don't celebrate in any way - in fact, we're spending the whole day cleaning out the attic! Admittedly not the best of days for this, as it's incredibly warm and sunny, but we feel very good about it. And speaking of good... I made this rhubarb mousse for friends a few days ago, and it was absolutely great! It comes from a new cookbook called Håkan Larsson's Vin och Fest (which means Wine and Feasts) which is a collection of different menus from the magazine Allt om Vin. (All about wine.) All menus sound very nice, and are indeed great for parties - maybe not so much for every day. The book itself is really quite fun to read, as the author has a nice, personal style, and also gives wine recommendations for each dish. Perfect! All in all - I recommend it. Not as much as recommend this particular mousse though - you *have* to make this! This recipe has three steps, and while it doesn't require a whole lot of active time, it will still take you a day to get everything cooled - so start in the morning. 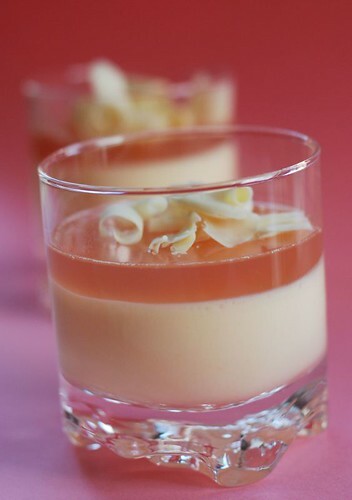 You start by making a rhubarb syrup, then the mousse and finally the jelly. I've made some minor changes - and it might be good to know that if you don't get enough rhubarb syrup from the first step, you can use a good quality rhubarb cordial as well. In fact, I have a cordial that's so good - from Brunneby - that I think I'll try this recipe just using that next time. I think it will work quite nicely! For the syrup, cut the rhubarb into small pieces and boil with water and sugar for 10 minutes. Purée everything using a handheld mixer or a blender, and sieve through a coffee filter. (I used a regular metal sieve at first, but it allowed some of the fruit to pass through and that made the syrup cloudy.) This will take a while - you should count on leaving it for a few hours. Mousse: Soak the gelatine in cold water for five minutes. Whisk the egg yolks and the sugar until fluffy and pale. Gently heat the rhubarb syrup, and add the gelatine. Stir until dissolved. Mix this with the sugar and eggs, and leave to cool to room temperature. Whisk the cream until it forms stiff peaks, and fold into the rhubarb mixture. Pour into glasses or bowls, and place in the fridge to set. Jelly: Soak the gelatine in cold water for five minutes. Gently heat the rhubarb syrup, and add the gelatine. Stir until dissolved. Leave to cool to room temperature, then gently pour over the set mousse. Place in the fridge to set. Funny, I ordered that book for a review, but i havent got it yet. When did you get yours? Seems as it is a nice book though! Vera - it came about two weeks ago, I think! Wow it looks so good and refreshing. I love rhubarb. This is beautiful. I've not had rhubarb before, and when I've seen it, it's usually in chunks in pie or something. This sounds delicious. What a fantastic use for rhubarb! I will definitely try this one. I really like the sound of this and I had something kind of similar in the back of my head for something I wanted to make this weekend. This looks awesome! I've heard and read about rhubarb, but I guess I never had it or know what's good for; well..I know it's for eating (I guess :-) ). For me, mousse is chocolate mousse. I know little about swedish food, but I like Anna's cookies, especially the gingerbread ones. I also had fish coup a couple of times. It was a norwegian recipe, I guesss, but I suppose that you may have a similar thing in Sweden. It was different than we make here in Portugal. I like that! I'm on a bit of a rhubarb kick at the moment, having made a clafoutis and a compote recently. It's just so beautiful and so tasty! Rhubarb mousse sounds yum. I love the delicate pink colour. I made this last week and added approx 100g of pureed raspberries to the mousse. Amazingly good. Must make the white chocolate sorbet to go with it next time! I started with this beautiful recipe, added strawberries and loads of whipped cream on top. A smashing success. In the Jelly part, I'm supposed to heat the syrup and add gelatine... but didn't I already use all the syrup to make the mousse? Nikki, you should have enough syrup for both! If your rhubarb doesn't yield enough, you can add a little bit of commercial rhubarb syrup or cordial (if you can find it), but last time I tried I had plenty left over. Yes, ok... sorry. Now I get it! Duh... !!!! Hi! What an amazing blog you have. I love your recipes. A question! I'm making your rhubarb mousse at the moment. How long do you need to set the cream in the fridge before you add the jelly? And how long time you can make this mousse in advance (without the jelly part)? Hi Lisanne! I'd say at least an hour, but ideally a little longer. Jiggle it to make sure it's set enough, and pour the jelly very gently over it. You can make it a few days in advance, but cover very well with plastic so it doesn't take on any odors from the fridge. It might form a slight skin, but the jelly will cover that anyway, so I wouldn't worry too much. Thank you so much for your quick response! The mousse is in the fridge right now.. can't wait to taste it!